Egypt is divided for administrative purposes into 27 governorates (محافظة muḥāfaẓah Egyptian Arabic pronunciation: [moˈħɑfzˤɑ]; genitive case: muḥāfaẓat [moˈħɑfzˤet]; plural محافظات muḥāfaẓāt [moħɑfˈzˤɑːt]). Egyptian governorates are the top tier of the country's five-tier jurisdiction hierarchy. A governorate is administered by a governor, who is appointed by the President of Egypt and serves at the president's discretion. Most governorates have a population density of more than one thousand per km², while the three largest have a population density of less than two per km². Governorates are either fully "urban" or else an admixture of "urban" and "rural". The official distinction between "urban" and "rural" is reflected in the lower tiers: i.e. fully urban governorates have no regions (markaz), as the markaz is, natively, a conglomeration of villages. Moreover, governorates may comprise just one city, as in the case of Cairo Governorate or Alexandria Governorate. Hence, these one-city governorates are only divided into districts (urban neighborhoods). Cairo Governorate consists of 41 districts; Alexandria Governorate consists of 7. 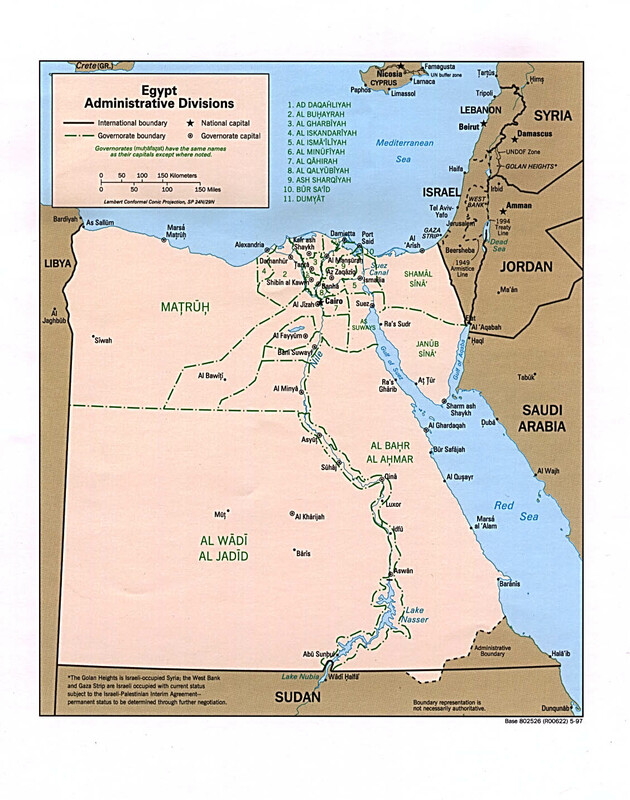 Non-urban Governorates in Upper Egypt and along the Suez Canal are all named after their capitals, while governorates in the Nile Delta and the deserts tend to have names different from their capitals (Kafr el-Sheikh, Damietta, and Matruh Governorates being exceptions). Two new governorates were created in April 2008: Helwan and 6th of October. In April 2011, however, the 6th of October and Helwan governorates were again incorporated into the Giza and Cairo Governorates, respectively. Luxor was created in December 2009, to be the 29th governorate of Egypt, but with the abolition of the 6th of October and Helwan governorates, the number of governorates has decreased to 27. The governorates are further divided into regions (markazes). Data taken from CAPMAS:. Information for population is in thousands, pop density - persons/sq.km and area is in sq.km. This page was last modified on 30 December 2015, at 14:36.